Have you ever thought about living in Mexico? Imagining yourself in a beach house or apartment with a view? Starting a small business down south? Because I’m going to tell you about something that can help you do all that and more. 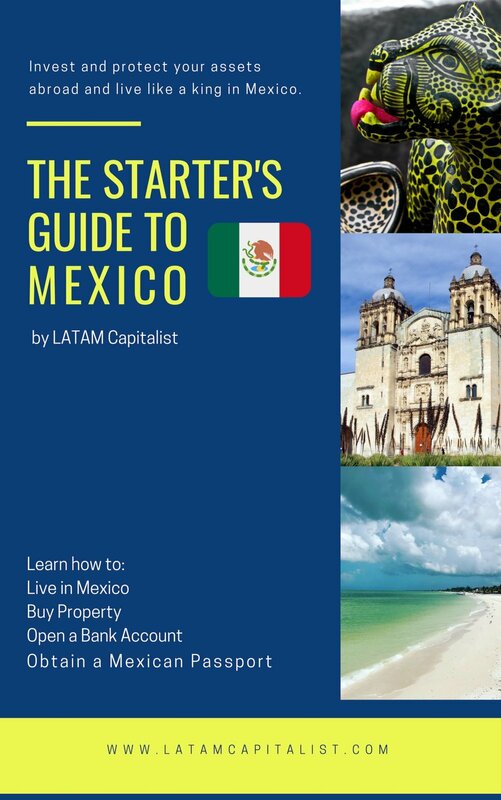 LATAM Capitalist, an investor in Mexico, has just released his Starter’s Guide To Mexico — a resource designed to get you seamlessly set-up south of the border. Why Should You Listen To LATAM Capitalist? LATAM Capitalist has very recently gone through these processes himself here in Mexico. Only a few weeks ago, as a matter of fact. In other words, this guide isn’t based on theory. He documents the process that he went through here in Mexico to get properly establishes. These are the same processes you will go through. Although there are other resources available on the Internet that cover the aforementioned, many are out of date. As of right now, it’s the most up-to-date resource you’ll find on moving to Mexico. You might be wondering how much a guide like this is going to cost you. If you’ve ever looked into moving abroad services, like Nomad Capitalist or Sovereign Man, you’ll know that such information isn’t often cheap. (for now, if he comes to his senses, I’m sure he’ll raise the price). If you’re planning to move to Mexico ASAP, in the future, or, if you’re simply curious about how things work south of the border, this guide is a steal of a deal. For more information, click that big button below 👇. That’s it for me, folks! You can thank me later 😉.